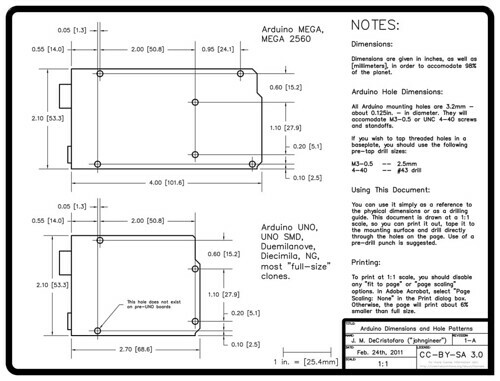 Arduino Hole Dimensions Drawing « Adafruit Industries – Makers, hackers, artists, designers and engineers! Arduinos are great, but if you’ve ever tried to mount one on a baseplate or inside an enclosure, you know it can be a pain. While there are some great enclosures specifically designed for an Arduino, if you just have a regular box that you want to use, you have to measure and mark out the holes yourself. If all you have is a ruler and a pencil, this isn’t the easiest thing to do. In the process of working on a robot project, I needed to draw up an Arduino hole pattern and outline in CAD as part of the design. I figured others could use a similar drawing — after some polishing up, I had this Arduino hole dimension drawing (PDF). You can use it as a reference to the dimensions or as a drilling guide. It is drawn at a scale of 1:1 on a standard 8.5×11 sheet, so you can print it out, lay the drawing down on your mounting surface, and use a pre-drill punch directly on the paper. I’d recommend you use the punch rather than just drilling through the paper, to avoid a “walking” drill bit. If you don’t have a proper punch, you can just use a sharpened nail (we’re not fancy here). In order to get it to print 1:1, you have to turn off print scaling in Adobe Acrobat. 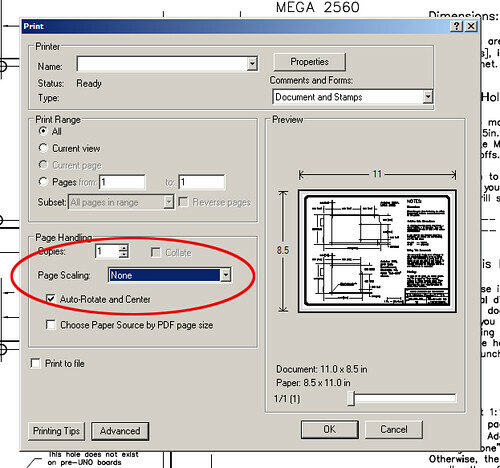 Somewhere in the Acrobat print dialog there’s going to be a “Page Scaling” option. Set it to “None”. There’s a 1-inch scale mark next to the title block in case you want to verify that it printed correctly. The drawing has dimensions for both the regular Arduino and the Arduino MEGA, and the hole pattern is good for all Arduinos going back to the NG (though the diameter of the holes might be different). The new UNO boards added a fourth mounting hole, which is indicated. It should also work with most “full-size” Arduino clones, such as the EMSL Diavolino and the Seeed Studios Seeeduino, as well as the Netduino boards. Thank you for making this, John! I really could have used this yesterday, as a matter of fact. I was trying to mount offsets for an Uno board and was having such a hard time. Anyway, I’m saving this for future reference. Thanks for making these drawings available. I am using them to verify my Eagle Arduino packages. My components appear to have been drawn correctly relative to your drawings. On the Mega board, the hole in the lower right corner is NOT located horizontally. I believe it to be 3.800 inches [965.2mm] from the front edge of the board. If this is the case then we agree on all locations. Suggestion: your scale mark near the title block should run both horizontally and vertically. Not all printers will keep the image square in both directions. Although now that I think about it, with the dimensions provided, I suppose one could check the print directly without the scale marks. @Vic – You’re right! I guess I missed one. It should be in the right place on the printout though — we checked it with the Mega and it worked. I’ll update the drawing. @signal7 – I’ll add a vertical scale reference in the next revision — thanks for pointing this out!